Russia aims to impose its rules on the deployment of peacekeepers in the occupied Donbass territories. Russia's pull-out from the Joint Centre for Control and Coordination (JCCC) in Donbas has only one goal: "the escalation of the conflict, the rejection of the peace plan, further retention of the territory of the Donetsk and Luhansk Regions, is aimed to hamper Ukraine's progress both in the economy and national security, and playing this card in the Russian presidential elections," the leader of People's Front Yatsenyuk said in the Freedom of Speech talk show on ICTV on Monday, 18 December. "What Russia did is another step and another confirmation that Russia is not going to any abide by any peace agreements. They have talked a lot about the so-called Minsk agreements, but today's decision of the Russian Federation is meant to demonstrate that they are not party to the conflict," he said. Yatsenyuk stressed that the Kremlin uses Ukrainian card for election purposes. "They have got nothing else to sell to Russian people." 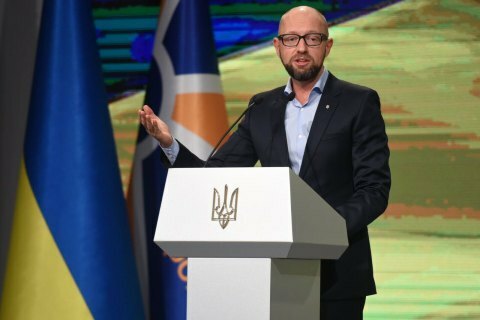 The JCCC pullout is an attempt by Russia to put Ukraine and the whole Western world into a situation when Russia will impose its rules on the deployment of peacekeepers in Donbas, Yatsenyuk said. The leader of the Popular Front said that the goal of the Russian Federation has always been and will always be: "Russia will never accept that Ukraine has chosen its own way by signing the Association Agreement with the EU. Russia will never accept that the Ukrainian citizens have the right to visa-free travel around the European Union. Russia will never tolerate Ukrainian independence." Meanwhile, Putin himself realizes that he is losing a lot in the war in Ukraine, and now the Kremlin is mulling the return of Donetsk and Luhansk territories to Ukraine, but on Russian conditions, Yatseniuk says. "This should be in the focus of major discussion, both in the pro-government coalition and among entire political elite – the conditions under which Ukraine is going to recover its territories." The politician believes that the return of Donbas should be done exclusively in Ukrainian national interests. On the peacekeeping mission proposed by Western partners and President Poroshenko, Yatseniuk said: "It is important that this peacekeeping operation should not freeze the conflict in Donbas. Unfortunately, the deployment of peacekeepers in most of the cases resulted in freezing of the conflict."